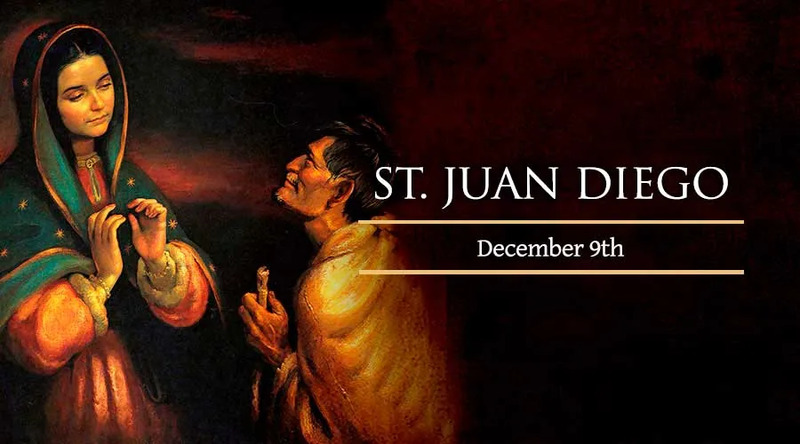 On Dec. 9, Roman Catholics celebrate St. Juan Diego, the indigenous Mexican Catholic convert whose encounter with the Virgin Mary began the Church's devotion to Our Lady of Guadalupe. In 1474, 50 years before receiving the name Juan Diego at his baptism, a boy named Cuauhtlatoatzin -- “singing eagle” -- was born in the Anahuac Valley of present-day Mexico. Though raised according to the Aztec pagan religion and culture, he showed an unusual and mystical sense of life even before hearing the Gospel from Franciscan missionaries. In 1524, Cuauhtlatoatzin and his wife converted and entered the Catholic Church. The farmer now known as Juan Diego was committed to his faith, often walking long distances to receive religious instruction. In 1531, he would be the recipient of a world-changing miracle. On Dec. 9, Juan Diego was hurrying to Mass to celebrate the Feast of the Immaculate Conception. But the woman he was heading to church to celebrate, came to him instead. She asked Juan Diego to make a request of the local bishop. “I want very much that they build my sacred little house here” -- a house dedicated to her son Jesus Christ, on the site of a former pagan temple, that would “show him” to all Mexicans and “exalt him” throughout the world. She was asking a great deal of a native farmer. Not surprisingly, his bold request met with skepticism from Bishop Juan de Zumárraga. But Juan Diego said he would produce proof of the apparition, after he finished tending to his uncle whose death seemed imminent. Making his way to church on Dec. 12, to summon a priest for his uncle, Juan Diego again encountered the Blessed Virgin. She promised to cure his uncle and give him a sign to display for the bishop. On the hill where they had first met he would find roses and other flowers, though it was winter. Doing as she asked, he found the flowers and brought them back to her. The Virgin Mary then placed the flowers inside his tilma, the traditional garment he had been wearing. She told him not to unwrap the tilma containing the flowers, until he had reached the bishop. When he did, Bishop Zumárraga had his own encounter with Our Lady of Guadalupe – through the image of her that he found miraculously imprinted on the flower-filled tilma. The Mexico City basilica that now houses the tilma has become, by some estimates, the world's most-visited Catholic shrine. The miracle that brought the Gospel to millions of Mexicans also served to deepen Juan Diego's own spiritual life. For many years after the experience, he lived a solitary life of prayer and work in a hermitage near the church where the image was first displayed. Pilgrims had already begun flocking to the site by the time he died on Dec. 9, 1548, the anniversary of the first apparition. Blessed John Paul II beatified St. Juan Diego in 1990, and canonized him in 2002.